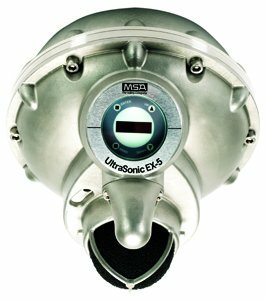 The UltraSonic IS-5 is a non-concentration based gas detector used to detect leaks from highpressure systems. Like other ultrasonic monitors, the UltraSonic IS-5 responds to the airborne ultrasound generated from gas releases in open, well ventilated areas, where traditional methods of detection may be unsuitable or dependent on ventilation. Because the UltraSonic IS-5 responds to the source of a gas release rather than the dispersed gas, it is unaffected by changing wind directions, gas dilution, and the direction of the gas leak. Further, with its maximum coverage radius of 20 meters, it can supervise a relatively large area with a single device. The UltraSonic IS-5 is immune to many false signals and can be configured to filter short timescale ultrasonic noise that can produce nuisance alarms. Frequencies below 25 kHz are removed by a high pass filter, effectively eliminating interference from audible and low frequency ultrasonic noise. At the same time, setting the alarm trigger level above the ultrasonic background noise ensures immunity to other noise sources. The result is a reliable method of detection, able to monitor environments with high levels of ultrasound such as turbine rooms and compressor stations. Besides high-pressure gas applications, the UltraSonic IS-5 is suited for installations restricted to low power (< 1 W).